Jacob Kaufman, MD, PhD, Duke University School of Medicine is one of five 2018-19 recipients of the Lung Cancer Initiative (LCI) Research Grant. Grantees receive $25,000 and are selected based on the measurable impact of their proposal and commitment to the lung cancer field. 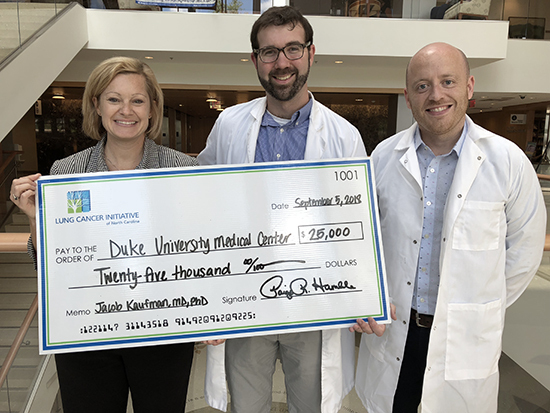 “We are proud of our partnership with leaders like Duke and their commitment to supporting fellows whose innovative ideas and leading-edge work will impact the future of lung cancer,” says Paige Humble, executive director of the Lung Cancer Initiative of North Carolina. The purpose of the LCI Research Grant Program is to partner with leading cancer centers to foster important research in their own communities and encourage researchers to enter the field. Many LCI grant recipients have gone on to receive continued funding for their work from the National Institutes of Health, Department of Defense and American Cancer Society. "I have had a long standing interest in lung cancer research throughout my MD and PhD training and am now reentering the laboratory as an oncology fellow with a goal of improving treatments for patients with lung cancer," said Kaufman. "The grant from the Lung Cancer Initiative is my first independent funding, and allows me freedom to explore my own research ideas and start the foundation of my career." Lung cancer claims more lives annually in the United States than any other cancer and more than breast, colon and prostate cancers combined, yet it is greatly underfunded. Since 2008, the LCI has funded more than $1.6 million toward lung cancer research. Kaufman will present his work along with other recipients at the LCI Annual Meeting on Sunday, Feb. 24, 2019.